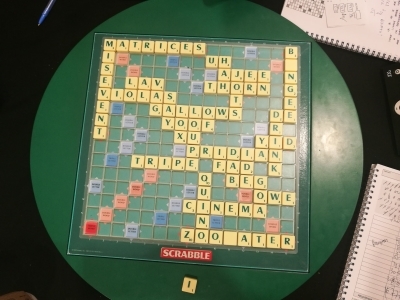 The Mattel World Scrabble Championships, run by The MindSports Academy (TMA) has been eagerly awaited the moment it was announced - Torquay was the venue and the scenery provided a memorable backdrop to what ended up being a week long festival of Scrabble of the highest quality. Of the many stories shared on social media (and in traditional media), we have chosen five of the notables: we hope you enjoy this look at #WSC2018. The event that was this year's "Worlds" may have been the focus of tournament Scrabble fans worldwide, and it is usual the more focus can be spent in the here and now with more recent goings-on. It may seem a long time ago now but this festival of Scrabble in Torquay commenced just a week earlier with the Junior World Scrabble Championship. As with 2017, Team Pakistan sent a strong contingent of the country's best young players to demonstrate their prowess to the World. The JWSC was a 24 game event - and Team Pakistan did not disappoint with their performance. Top of the list was Moiz Baig (pictured), a previous winner of the World Youth Scrabble Championship. His high game score of 539 may not have reached the heights of others (the highest being 682 by Monis Khan) but he was near on unstoppable, dropping only the 4 of the 24 games to be played, securing him a deserved victory (and the only player to win both a World Youth Champion title and Junior World Scrabble Champion title during his playing career!). The Pakistan team's performance was recognized throughout their domestic media with many the plaudits provided to them. The players themselves continued into the Main Event, making it a very long week of Scrabble. 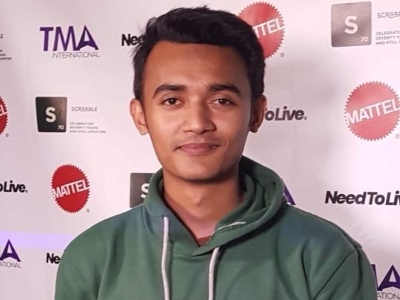 Moiz finished WSC2018 in 44th place, winning 17.5 games of the 35. Seven of the top 8 in Division 2, however, were from Pakistan and their endurance play won out, with Hammad Hadi Khan emerging victorious. The Runner-Up at the JWSC just days earlier had secured a title in the Main Event. As one would expect at an event featuring top players from around the globe, there were plenty of high games to note. Twenty times the 600 barrier was exceeded in the qualifying rounds, and, of those, four of them went past the 650 mark. Two former World Champions were both the winners and the vanquished on this list. The 2016 World Champion, Brett Smitheram, was one of the early pace setters having a 621 in Round 2 (vs Quentin Baker). However, in Round 28, Brett would be on the receiving end of Dave Koenig's massive 657. Thirteen rounds earlier, Brett's game against 2014 World Champion Craig Beevers featured the tournament's highest game score - 686! Craig would be on the receiving end of Wellington Jighere's 664 in the penultimate game whilst a game earlier, Jason Ubeika came closest to beating Craig's high game with a 681 against Gwen Rea. Yet, for all the high scoring, the highest game score came in the Final Fling: Theresa Brousson's amazing 777 against Anlaug Frydenlund is unlikely to be beaten this year as the highest game score and enters the WESPA 700 Club at Number 2. You can see the board pictured. Tournaments such as these are always great opportunities for players around the globe to meet up with their international counterparts and share their enjoyment of the sport. As Norway's Rick Fawns noted "it's always going to be about the people i'm around and less about the game itself. Those I spent time with collectively are great fun and the Norwegians were as crazy as always". Soon, though, the focus will turn to the words played (as it should in a game that is primarily about words). Rick continues "I would have to say my best personal in game moment was the sheer irony of spotting the chance of and playing XER(A)F(iN) for 48 to seal a win against Joanne Craig." Goutham Jayaraman, 4th at the 2017 WSC, observed "I'm not exactly happy with my performance but i did manage to draw into a lot of cool bingoes"; bingoes that included NOSTALGIC, CHEVRON, AFFIRMED, COMMANDO. He went on to say "I had 3 esses in one go, playing (UN)ALARMED keeping ESSSS and then [play] STRESSES against Wellington Jighere. Elie Dangoor reflected on one of his games "The best bonus played against me at the WSC: I thought I had this game wrapped up, until Paul Gallen went out with DEAMINATE. 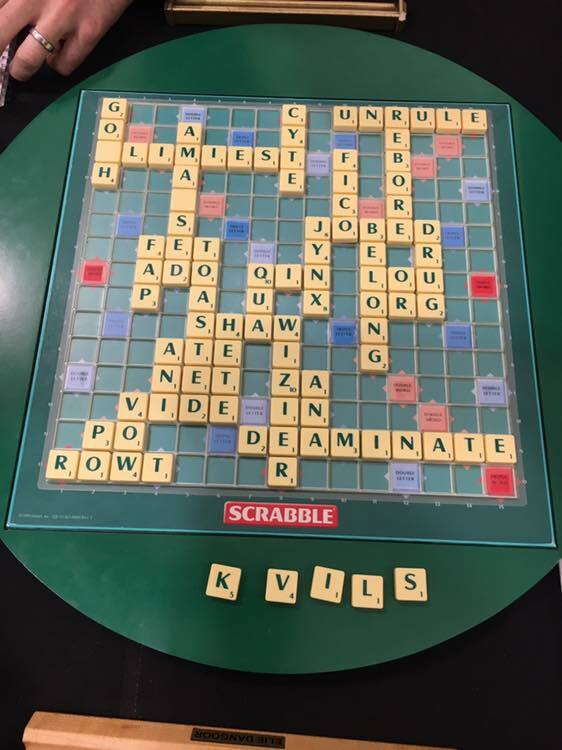 Paul Gallen's name received another mention by Dave Koenig, when he stated "KILOWATT as a natural through the A was probably my coolest bingo. I played it against Paul Gallen in the same game in which he played a natural DOUBTFUL through a B". Nigel's 9 timer HUSHEDLY against Brett Smitheram was amazing - though it was not all about 7 and 8 letter plays. 2018 WSC Quarter Finalist (and 2014 WSC runner-up) Chris Lipe provided us with some 9 letter highlights - "I played four nines in the tournament — two as outbingos (MAGNETIZE and CAUTERIES) and two in the QF v Jesse (TANGENCES disco on live stream and then TRAINABLE thru AB)". TANGENCES an inspired find holding ACEGST? and going through two unconnected floaters at a crucial time of a Quarter Final: you can see the end game board pictured. 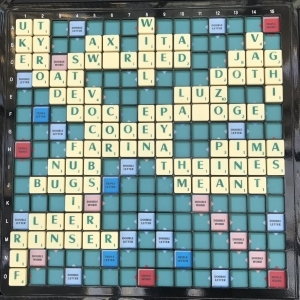 The first two games of the Final were relatively one sided with both players taking advantage of the tiles before them. Jesse Day went 1-0 up with a 541-391 victory whilst Nigel Richards evened the ledger with a 536-307 reply in Game 2. However, Game 3 was the game that kept fans enthused and engaged, with a few observing it as one of the games of the tournament. A game where Jesse took an early lead after playing EPAGOGE,maintaining a handy lead to the 30 minute mark. Nigel's rack of DELRSW? offered up SWiRLED with an immediate reply of 50+ due to the placement of the blank and Jesse holding the X, giving him a 60 point lead. Endgame awaited, with the Q unseen. Nigel's rack of EIILRSW and a floating E led to questioning whether Nigel would pull the trigger and play WISELIER to regain the lead. 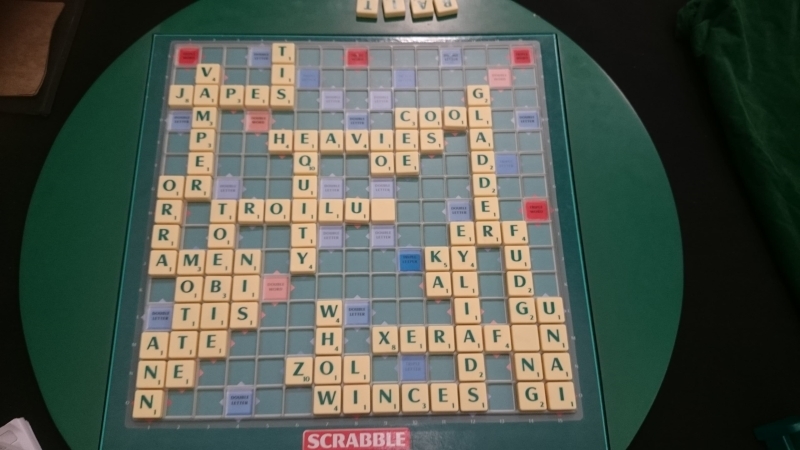 With an unseen Q, Nigel opted NOT to play the bonus (going for WILL instead), prompting plenty of discussion in the chat rooms as the strategic aspect to Scrabble came to the fore. 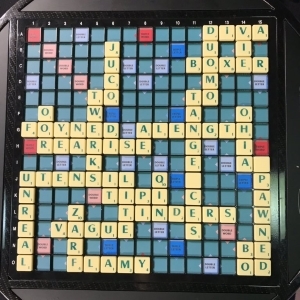 The decision not to play the bonus paid off: the endgame, however, was tense as Nigel gradually reduced the margin, eventually leaving Jesse "Q-stuck" with a 445-423 win (pictured). For those who have not viewed this game, this one is well worth the view! 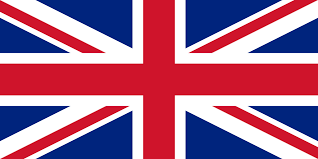 Watch the final two games of the Final in London here. 5. The 4 time Champion! 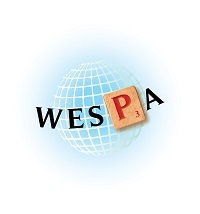 The WSC 2018 Final was a wonderful showcase for tournament Scrabble. Two early games may have been one-sided and the third is destined to be talked about for many years to come - it is in some ways appropriate it took 4 games for Nigel Richards to secure his 4th World Title, having last won the event at Prague in 2013. The fourth game was a 1000+ game, as Jesse's play of MALEDICT gave us a final scoreline of 575-452 in Nigel's favor. 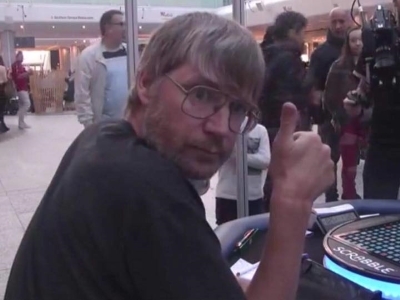 Prior to that final game, Nigel's thumbs up (pictured) on the live stream a portent of things to come as his pick ups of blanks, the X and Z came at all the right times. The victory adds to his 2018 French Title - and minds wander toward whether a venture into Spanish Scrabble is to come. For now, the player many consider the GOAT, has secured his fourth World Title. If the predictions were anything to go by, it seemed many were expecting Nigel to be victorious though there was a lot of support for Jesse in his efforts. Their head to head going into WSC2018 was 8-6 in Nigel's favor and with two defeats in Torquay, the record evened to 8-8: it was always going to be a tense affair and the final did not disappoint. As one Twitter follower observed: "Nigel is the best Scrabble player in history. Jesse is the future..."
Click here for the results of the Junior World Scrabble Championship.